Legacy is my multi-million dollar system for creating a profitable, mindful business and living the life of your dreams. Hello future and existing entrepreneurs! Lewis Howes here, New York Times bestselling author, former professional athlete, and host of The School of Greatness, one of the top 50 podcasts in the world. I’m also the guy who lived on his sister’s couch for a year and a half, depressed and broke after an injury ended my football career. I’m the one who had no clue how to make money doing something I was excited about once sports was no longer an option. I’m also the one who built an entrepreneurial career, step by step, because I had a vision of creating something meaningful and great. But, I knew there was something great deep within me. I kept pushing and kept exploring. A new vision emerged and I built a career as an entrepreneur by creating something meaningful and great. Today, I’ve created multiple 7-figure businesses and have coached many top entrepreneurs on how to do the same. My hope is that I can help you unlock the greatness within you to help you do the same. And today is THE DAY I help you do that. Are you truly happy or fulfilled with your current work or career situation? Are you satisfied with the level of freedom, income, flexibility, joy, and passion you currently have in your career? Well, the truth is, I already know the answer to that question for most people. For the last decade Gallup Research has been examining worker satisfaction and engagement around the world. In 2013 Gallup published a study that reported 87% of workers worldwide are NOT engaged at work. This is absolutely mind boggling that people spend the majority of their life doing something they don’t enjoy. 87% of workers worldwide are NOT engaged at work. That’s almost 9 out of 10 people! Oh, and don’t worry, I’m not forgetting about the struggling entrepreneurs. I’ve been there myself. It can take years and years to finally BREAK through and taste real SUSTAINABLE success. You’ve likely read various blogs, listened to podcasts, and watched youtube videos, while hoping you’ll eventually come across some magical advice that not only sounds legit, but speaks to you on a deeper level, and ignites your greatness. Creating a change in your business can be challenging, especially if you’re not guaranteed results. Sometimes it feels like jumping, but not knowing if you can actually fly. And no one wants to run into a dead end financially, when they’ve taken the leap to follow their passion. Do you ever feel worried or stressed out in your business? Are your expenses piling up leaving you wondering how you will pay them? Are you working many hours with little return and progress in your life? Do you feel like you’ve lost that excitement because you are not seeing the results you know you are capable of? Imagine having a business you’re proud of. The latest finding from a 5-year ongoing study by MBO Partners uncovered a ton of incredible truths about “independent work” that most people know nothing about. That we’re not good enough, that we don’t know enough. And trust me, I was a master in this department. Here’s the thing . . .
That’s all totally normal, we all go through that. But the best part about life is that everything is a choice. We’re all captains of our own fate. We choose which direction to set sail on a daily basis. You CAN change your situation. Almost half the people surveyed - 45% reported that they make more money working on their own now than they ever would in a traditional job. They just say it’s neither more secure or less secure, it’s a LIFESTYLE. You see, once you transition into becoming a lifestyle entrepreneur, you realize that there is no failure in this game, there’s only giving up. We aren’t out there getting funding from VC firms in Silicon Valley. We’re building a business around our passion and doing work that lights us up. If you follow the right path, success is inevitable. And don’t even get me started on how much easier it’s getting. With today’s technology, the amount of information, tools and resources, anyone with determination and focus can begin to see results for themselves. I’m not saying it’s an easy walk in the park, but it’s never been easier. I want you to imagine what it would be like to look back on today one year from now. Imagine what it would be like to have a business you’re proud of. A business that feeds your lifestyle, your pockets, and your soul. Imagine waking up in the morning to an email report with your sales for the previous night, and find that you are making more money now than you ever were before with that struggling business or current job. Imagine being an inspiring leader that people look up to and want to learn from. Imagine celebrating life on a daily basis with your family, friends, loved ones, colleagues, and all the people you care about, and having the ability to pick up the bill at dinner that night. Imagine having REAL security, knowing that you’ve built the skills and knowledge to create a business from scratch all over again if you had to. Picture and imagine yourself surrounded by like-minded people all living on the same wavelength, understanding how to live abundantly, adventurously, and joyously. Once you’ve tasted this life, wouldn’t you want others to get the same opportunity and taste it for themselves? Wouldn’t you want to see people live their passion and create the life they’ve always dreamed of? And that’s exactly why I’ve been working with top level entrepreneurs doing 1:1 coaching for the past 8 years. It’s why I’ve developed multiple courses training people how to build up different aspects of their online business, and it’s why I’ve decided to finally share with you today, my program that is the exact step-by-step formula I stand by with my businesses, for how to start and grow a successful online empire. Within the first two weeks of taking Legacy, Austin, a digital marketer, closed on one $36,000/year client. This exclusive course will show you how to build an online empire of your own, and is the closest thing I’ve ever offered — and will ever offer — to getting coaching directly from me. Legacy was designed with you in mind. It’s an educational system that I’ve developed from reverse engineering my success as an entrepreneur, author, podcaster, speaker, and coach. This is the most complete program I’ve ever put together. I’ve spent years developing this exact proven system, giving you a step-by-step path to follow. You get to tap into my years of experience, knowledge, tactics, and connections to know the exact actions to take to evolve into a thriving entrepreneur. My mission is your entrepreneurial success. All course materials, including downloadable videos, action guides and more are in your secure online membership area. To know how to grow your business, you need to know where it is you are going. So first, we’ll dive into what ou want to create in your life, and, using my goal setting methods, you will have a clear picture for the path ahead. You’ll learn why people don’t reach their goals and what will be required from you in order to turn everything you want to achieve into a reality. Now we’re going to dive into the finances of your legacy. Yes, already. There’s a reason that money is tied to big dreams. You have to have money to finance your legacy. And there’s nothing wrong with that. So we’ll take a look at your current finances and then figure out what needs to shift to align to your long term goals. Then we’ll define your specific profit strategy and go over all the best options to see which one fits. You’ll learn how to test the market for your idea, refine it based on feedback, and you’ll use my “Pricing Calculator” of how to price your product to meet your goals. Are you ready to stretch yourself? This lesson is designed to move you outside your comfort zone to get RESULTS. Yes, you’ll be putting your product out to market for one weekend and make some money. Of course it won’t be perfect and mistakes should be expected, but that’s 100% encouraged. Releasing your “minimum viable product” to your audience will give you the feedback necessary to bring your product to a larger audience. And you will get paid to create the product because you are able to get paid prior to creating your product. In this lesson we’ll get into the nitty gritty details of outlining your product based on the feedback you’ve received and the ideal client you’ve identified. Once you’ve outlined the whole thing, we’ll go back and refine your summary of the product so that it demonstrates the incredible value you have created. And yes, you’ll get feedback again (from your Legacy peers) about your product. What should you charge for your offer? Before making this decision, you will want to understand the various pricing strategies available to you and the psychology behind them. We’ll cover several methods around pricing and you’ll finish the lesson by deciding how you want to package your product so that there is not only incredible value to your customer, but a healthy profit for you to keep growing your business. It’s time to start building your launch plan for your product now that you’ve outlined it, priced it, and packaged it. There are three main methods to launch your product and you will pick the one that works best for you. Here you will gain clarity on how to set up your launch, deliver your product effectively, and make the biggest impact with your product in a short window of time. Your brand not only has to align with who you are at the core, but also must connect with your audience. This is a fun, personalized, impactful, and creative module. We’ll cover what a personal brand is, how to design yours from an authentic place, and the keys to building a long term strategy to develop your brand as you grow. You’ll also learn what inspired my brand, and how to use other brands you adore to shape your own. Facts tell and stories sell. In a time when there is so much competition, stories allow people to connect and relate with you so that you can build a true loyal following. Your brand can only say so much without you knowing how to share your personal story. Now we’re going to get into the details of how to master telling your story for a variety of audiences so that people GET who you are. This includes your bio, your about page, and your copywriting style. You have your brand. You have your story. Now to use these to build authority online. We’ll start by exploring the elements that create influence. You’ll learn the three ways to build your authority quickly (even if you have zero press or testimonials). Also, you will understand the long-term strategy for authority building. And get ready for another challenge as I’ll help you implement these three paths to authority. 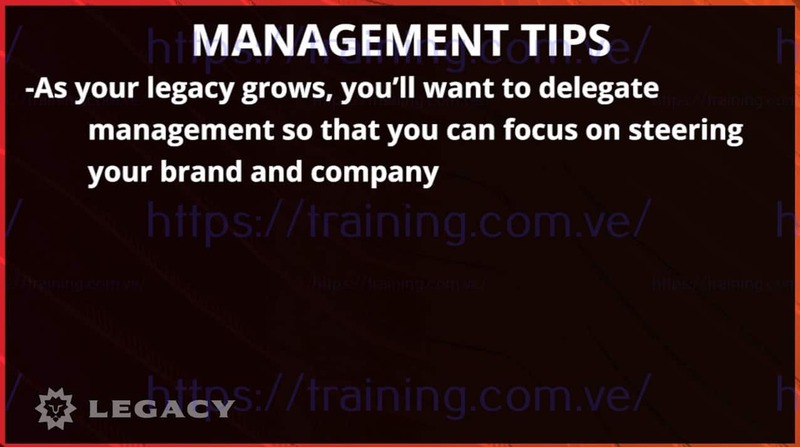 Next, you’ll create your “Legacy Creed,” which is a guiding document containing the principles and values of your business so that you never lose track of your mission. Whether you’ve already got a great website or you’ve never looked at the backend of a WordPress page, it’s important for you to understand the basics of quality website design and the elements that should be incorporated into your site. In this lesson I’m walking you through what it’s important to do yourself and what you should outsource. We’ll also go over how to communicate what you want to the designers you hire and the best resources to use when starting out. One of the most important skills to develop as an entrepreneur, no matter your industry, is presentation and speaking skills. Even if this is your worst nightmare, I’ll walk you through how to deliver captivating public speeches, network at events, build authentic relationships, and host live online events. I’ve also got a special guest interview that will teach you how to warm up your audience to your offer if you are speaking from stage. The final lesson in this unit builds on everything we’ve talked about regarding personal branding. I’ll explain how to be seen and heard by major media outlets so that they give you the A-list exposure no matter where you’re at currently. The end goal of this lesson is to show you how to stand out from your competition by attracting mainstream press and how to leverage it for your credibility and brand. You’ve probably heard that content is king when it comes to building a following online. This isn’t the whole story, but it’s still really important. So in this lesson we’re going over how to write fascinating content that gets seen and remembered - especially strategy around headlines. I’ll go over the basics of SEO and getting featured on bigger platforms. Learn how to get traffic from multiple sources and get people excited about the content you’re going to share next. Social media has been a huge driver in my business. Here I will reveal the secrets I’ve used for social media success. I go into real detail on each platform and we’ll figure out which ones are best for you to use, strategies to maximize their reach for your brand, and how to attract the most followers while building out a content strategy that will keep them engaged. As a special bonus, you will learn paid traffic strategies using Facebook ads from my ad agency. Ever wonder how to attract affiliate partners that are a perfect fit to promote your offer? You can build real, honest business relationships and turn them into a win-win for all. I’ll explain how it all works and how to make it long-lasting. I break down the numbers of what works when setting up affiliate agreements and how to protect yourself in these contracts (as well as show up responsibly to your affiliates). Sales are the lifeblood of your business. Many people have brilliant ideas and execute well, but don’t convert their offering into real sales and dollars. Whether you feel great about selling yourself or you are terrified, we’re going to walk through the ins and outs of sales. We’ll start with the psychology of sales, incentives and influence. Then we’ll be ready to talk about HOW to sell without being salesy (yes it’s possible). This lesson is where you learn how this online business works. We’ll work to develop your online marketing strategy and optimize how you acquire new leads and automatically lead them down a “funnel” to becoming a customer. We’ll go through the technical stuff like how to set up great sales funnels, landing pages, check out pages, and our recommendations for payment systems. We’ll talk about how to lead a potential customer from seeing your work all the way through to typing in their credit card number and becoming a loyal client. Now that you understand the tech side of sales funnels and turning leads into customers, let’s talk about the content and copywriting side of this. We’re diving into the best way to build your email list (with the right kind of people subscribing to it) and of course, I’m giving you another challenge! Also, you get to learn from one of the smartest guys in the world on this topic, creator of AppSumo, Noah Kagan. No matter how much you know about what to do to build a legacy, it doesn’t matter if you don’t have a solid way to do it. In this lesson we’re talking about one of the most important habits to develop - how to be productive on a day to day basis. We’re going over morning routines, scheduling your day, and getting organized in a sustainable way. You’ll have a healthy balance of work, recharge, and creativity. In business, it does not serve you to be a jack of all trades. You want to play to your strengths and delegate the rest. Delegation and outsourcing can seem intimidating if you have never done it before, but we’ll make you comfortable with it. You’ll learn how to manage a virtual assistant and how to choose what tasks to give away versus keep to yourself. When you have people and systems supporting your, you are able to focus on what you are best at. This is the gateway to you and your goals. You can dream big but without a solid way to manage and move along your plans, they won’t get far. We’re introducing you to our favorite project management tool as well as the best project management practices. We’ll also cover goal setting do’s and dont’s to set yourself up to win. Hiring can be one of your biggest investments. And investments can go south if you don’t know what you are doing. You can only get so far as a lone wolf. As your business grows, you’ll need to build up your team and create a work culture you enjoy. I’ll talk about hiring talent and setting good management principles in place. This lesson includes communication strategies, creating a great culture to work in, and the right way to give feedback - so important! If you’re just starting out, it’s very important to set up the legalities and finances the right way. This lesson is a high level overview of what you need to pay attention to as you set up your books and contracts, and what to pay a professional to handle. The sooner you let the professionals take over, the smoother your day-to-day operations will run. I’ll talk about start-up tools, resources, legal principles, contracts, accounting, trademark issues — everything you need to set up your business the right way. One of the best ways to get new business is to go above and beyond for your current customers. We’ll discuss treating your customers the right way, which means they will come back again and again - AND they will refer you to all their friends. We’ll talk about how to create an awesome customer service experience, how to handle refunds and exchanges, and unique things you can do to create customer loyalty. We’re happy to answer any questions you might have and help you make the wisest choice for you. 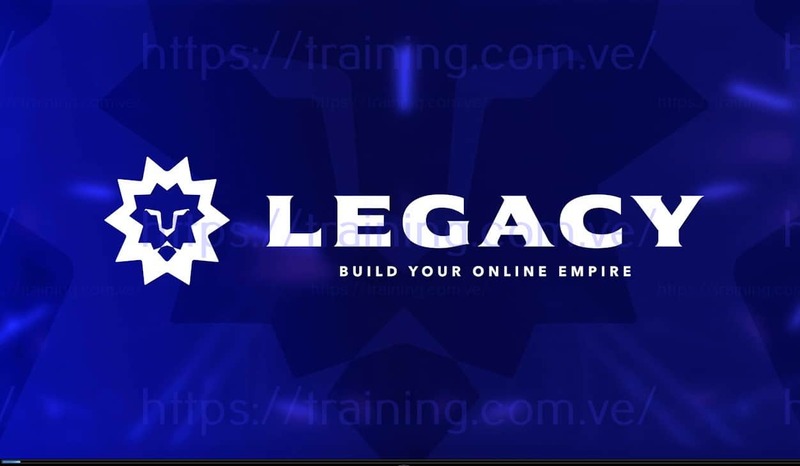 Legacy students have created some amazing results in their business just by taking massive action on what they learned and were challenged to accomplish through the course material. Aggie, a travel blogger, who launched her first online mastermind and made $15,000! Laara, a professional international painter, who started in her online business at 70 years old! Lucas, a business consultant, who signed 3 new clients in the 1st 2 weeks of Legacy! Upesh, an accountant, who made his first sale in his online business! You’ll receive downloadable, fillable worksheets with each video - so you can keep track of your progress and the exercises you do! No other course focuses on results as much as Legacy does. The series of challenges I have designed throughout the Units of this program will propel you forward into taking action on your goals and business. If you are struggling with how to think abundantly like a WEALTHY person, and would like to do so on a daily basis, this training will give you a process for thinking like a winner all the time. Many entrepreneurs struggle and need help in this area. My Stress Management training will show you how to turn those exhausting and dreadful moments around instantly. There is a way to learn from the overwhelm and shift into a positive space where you have enough time to handle everything. Get the exact email templates and marketing promotion schedules I use for my course launches. Learn from my expert team with years of Facebook Marketing experience. Learn from my secret weapon videographer who helped take my YouTube account from 30,000 subscribers, to over 100,000 subscribers in 1 year! Learn from my project manager all about how to navigate our team’s preferred project management software, Asana. When you join Legacy, you’ll be added to a private Facebook community of like-minded entrepreneurs. This is your opportunity to network and form lasting lifelong relationships and partnerships with people who are in similar industries with the same goals. I’ve added tons of value by including interviews with influential marketplace leaders - my personal network of geniuses.I don’t pretend to be the best at everything myself, so I went out and got world-class leaders that are experts at what they do to share their secrets with you. I’ve got your back - guaranteed. We’ve got all the - support you’ll need. as soon as you join and all along the way. You’ll get the chance to network with others in the course and get feedback on questions right away. You’ll get access to my expert team including my project manager, producer, videographer, and assistant to answer any specific questions you might have! A custom curriculum around your life and your schedule! The course is available 24/7, so you’re able to learn when it’s most convenient for you. Take this program on the go, at the gym, at work, or at home. When you enroll, you get lifetime access. This means you can work on each section in your own time. I understand that everyone learns differently, which is why I’ve done my best to make clear action guides to help you learn as you go through the curriculum. I’m confident you’ll see the rewards from this program if you put in the work. And I’m so sure of the benefits of this course, that I back that up with my risk-free money back guarantee. Here’s how it works. Complete the first two Units of Legacy. If within the first 14 days after your purchase, you don’t feel we’ve delivered the value — just email our support team, show us your completed coursework and we’ll issue you a full refund. The reason I ask for your completed coursework is simple. I only want to work with people who are committed to taking action. I’ve poured blood, sweat, and tears into this course and into my students, so it’s important to me that you’re as dedicated to this program as I am to you. Sherry Smith followers have been growing by 70% week after week. Legacy gives you a proven winning formula with a clear action plan. A step-by-step system to start an online business the right way so you can avoid all the costly mistakes most entrepreneurs make when first starting out. This program was created to help you take action on your goals and your vision. This isn’t just like any other courses with videos you watch and then don’t implement in your business. There are challenges throughout the course designed to push you to step into action, and get out of the analyzer mindset that often holds people back. There is plenty of free information about building an online business available on the internet. However, if you don’t have clear direction from a reliable source, all the information in the world isn’t going to help you. And you’re probably going to end up wasting a lot of time and energy, testing and failing, and spending money on things that aren’t working. Do I get coaching from Lewis? How is Legacy different than your other courses: 7 Figure Webinars, School of Greatness Academy, and Profitable Online Courses ? How is Legacy different than any other online courses out there? Do I get lifetime access to the Legacy Course? Is Legacy right for me? I’m currently in SOGA. Can I take this course too? I’m currently in 7 Figure Webinars. Can I take this course too? Tuition & Guarantee How much does Legacy cost? Can you set up a PayPal payment plan? Will this work for _____ industry that I’m in? Can I learn this all online for free? When will the next Legacy session open up again? I’m here to coach you and help you on your personal path to building a profitable and mindful business . . . so you can live the life of your dreams. Think about that day, when you’ll be able to look back and feel the gratitude for the empowering decisions you made. In fact, I want you to feel the gratitude right now. Feel grateful for being here today, and where you will be in the future. All we can do is grab hold onto life and live it to the absolute fullest. Legacy is an experience I know can transform your career and turn you into a thriving entrepreneur.